After many years experience in customer services and IT service delivery I decided to have a complete career change. Currently self employed and offering a range of fitness solutions, from swim and open water coaching (triathletes and masters) to studio cycling/hydro fitness and sports therapy and event management. In my Swimease business communication has to be prompt and professional in order to secure and hold new clients. I have excellent interpersonal and technical skills and embrace social media in business. I co-ordinate venues, course bookings and events. I coach swimmers and have worked in football as a sports therapist many years ago. I started life as a swimmer, giving up my dreams when I was in a severe road traffic accident age 12. It took many years to return to swimming, but I was encouraged by my parents to run/walk, play racquet sports, anything to help get me walking again. In later life I participated in many events 10kms, more recently triathlons - gradually embracing the longer distances - I have successfully completed Marathons, long distance cycle rides, an ironman distance triathlon and several endurance swims including our very own Everest of swimming challenges, the English Channel in 2015 and 2017. 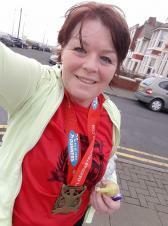 I am fully aware of boundaries in sport, self perception, cant do belief and work hard at encouraging others to try something new, believe in themselves and take pride in what they can achieve whether it be a endurance sport of a couch to 5km. I reflect on my own doubts, and experiences and how to overcome these in the inspirational talks that I host.